DISCLAIMER: I am a Sport Chek ambassador but all views and opinions are my own. Thank you for our support of these sponsorships that make this blog possible. And thank you Sport Chek for having me on the tour! 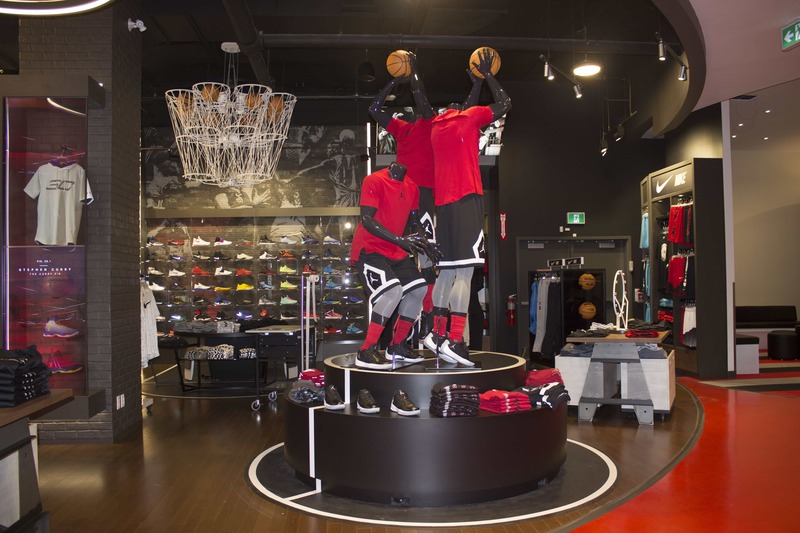 On Thursday July 28th, I was invited to check out the grand opening of a Sport Chek x Atmosphere flagship store. It was quite the experience and I have a lot to say about it so I’ll be breaking this up into a 3 parter. Today, I’ll be highlighting my favourite features of the store itself. 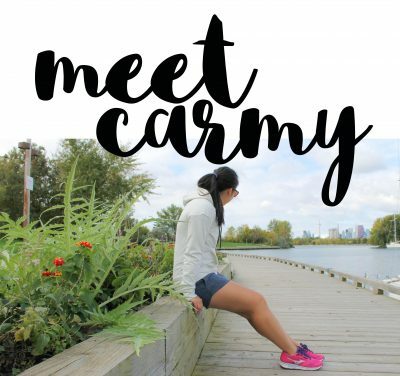 Part 2 will be a post about finding my running mojo again and some advice with fitness expert Alicia Bell. And part 3 is a secret! Bright and early, I was picked up by the Your Better Starts here sedan with fitness expert Alicia Bell and we were on our way to Sherway Gardens. On our way there, we chit chatted about all things fitness and motivation which was perfect as you all know I had been in a little bit of a slump lately. Anyways, let’s stick a pin in this and move on! More about our chit chat in part 2! 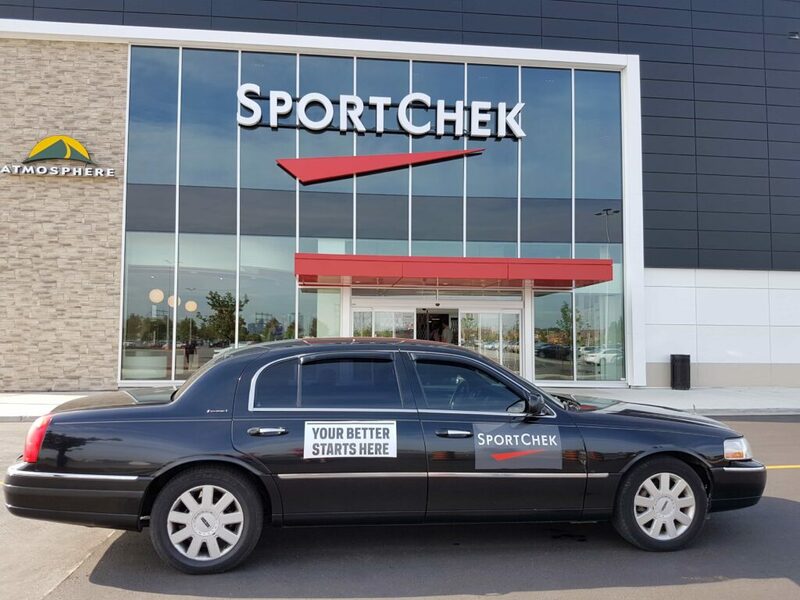 So what’s so special about this specific Sport Chek? Well, not only is it the biggest with 3 floors – it is combined with Atmosphere. Atmosphere is your one stop shop when you need gear for your outdoor adventure such as hiking, climbing, canoeing and more. Combining the two stores means you don’t have to go far if you’re looking to dip your toes into some outdoor fun! Whether you want to get fitted for a pack, pitching a tent, lighting stoves, or testing different types of stove fuel, Atmosphere can help you get the right products for your outdoor adventures! Anyways, let’s get started! Below are my favourite features of the newest flagship store at Sherway Gardens! 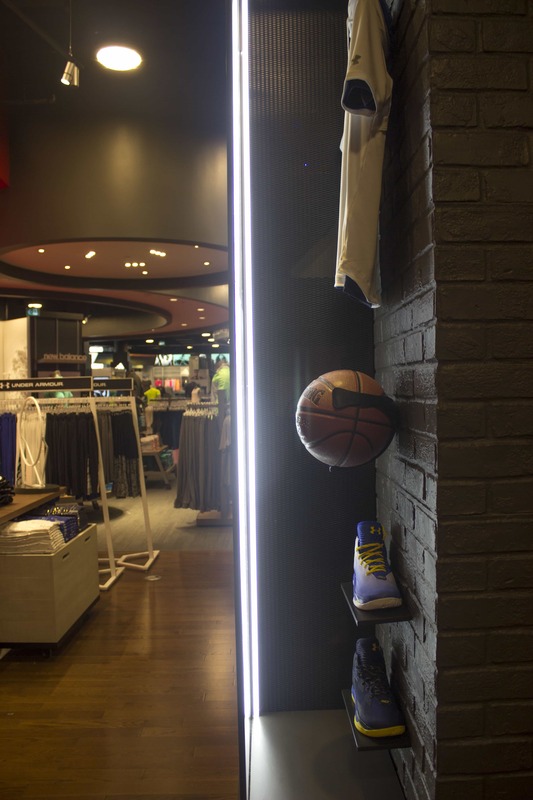 When you first walk into a flagship store you go under the portal as pictured above. When you walk in, you get the feeling of immersion into the sporting world. There are graphics constantly moving and changing all around you from the ceiling to the side. This is their first basketball shop that they’ve opened. 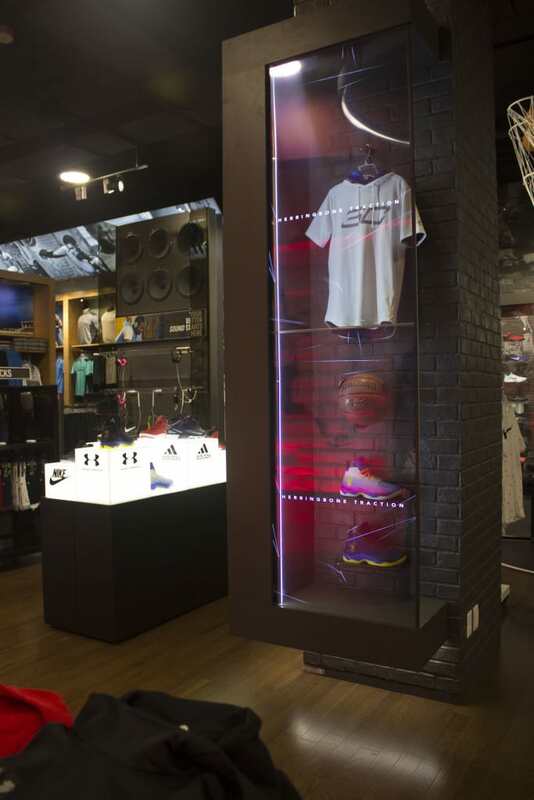 There is this amazing glass display where they tell stories in with the product behind the screen. And the part I was impressed with the most? A LIT HYDRAULIC DISPLAY (inspired by displays that were seen in Seoul). Kind of amazing no? Y’all know how much I love touching things (ahem, totally tried to touch the dinosaur bones and display items at the museum) so whenever there’s touch screens, I am all over that! 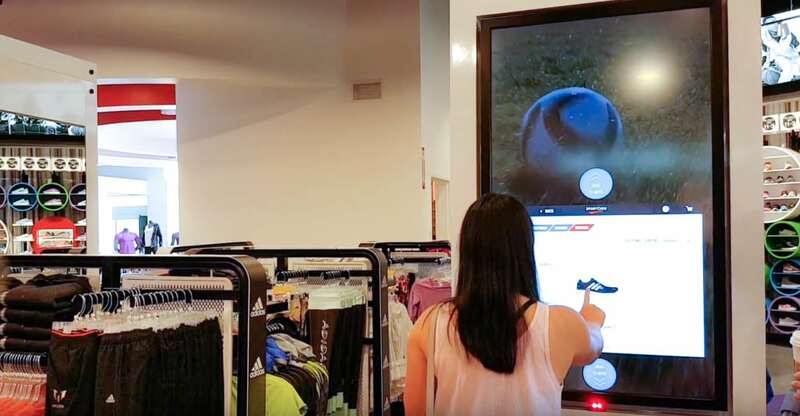 Sport Chek has these touch screens where you can check out their product online and buy it then and there online if it is not available in stores. 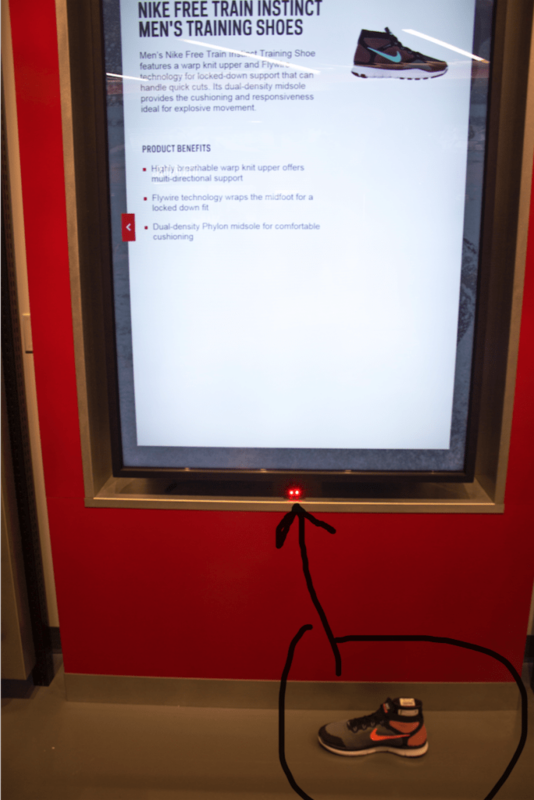 Excuse my potato image but… all shoes on display have an RFID tag in them so you can put it up to the sensor at the bottom of the touch screen! Information about the shoe is then shown on the screen so you don’t have to use your data plan to Google the shoe you’re interested in. Pretty nifty huh? 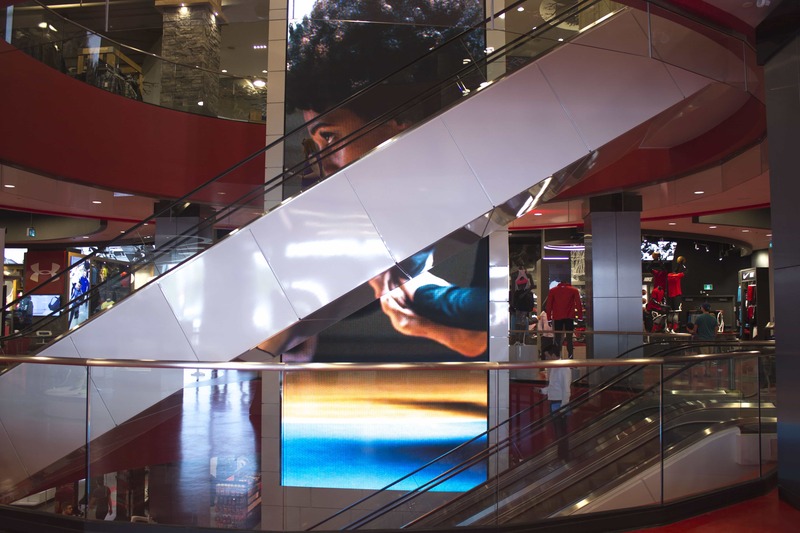 Also, this two storey monolith display? Amazing! 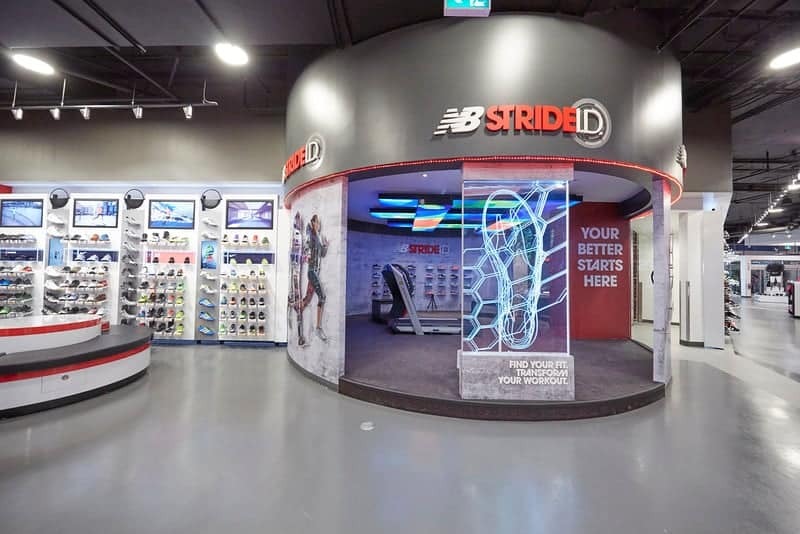 The New Balance Stride ID has a 3D scan technology that is an innovative system that scans your feet to generate an advanced fit analysis and recommendation. First, you start with New Balance volumental, a foot scanner that provides analytics around foot size, arch and pressure mapping. Next, a computerized analysis of the customer’s running gait is performed using Medical Motion’s gait analysis technology on a treadmill. I love treadmills. I am one of those people who love being on a treadmill and don’t mind taking my run inside so imagine my surprise when there was a climbing treadmill on the upper floor where Atmosphere was located. How cool is that? 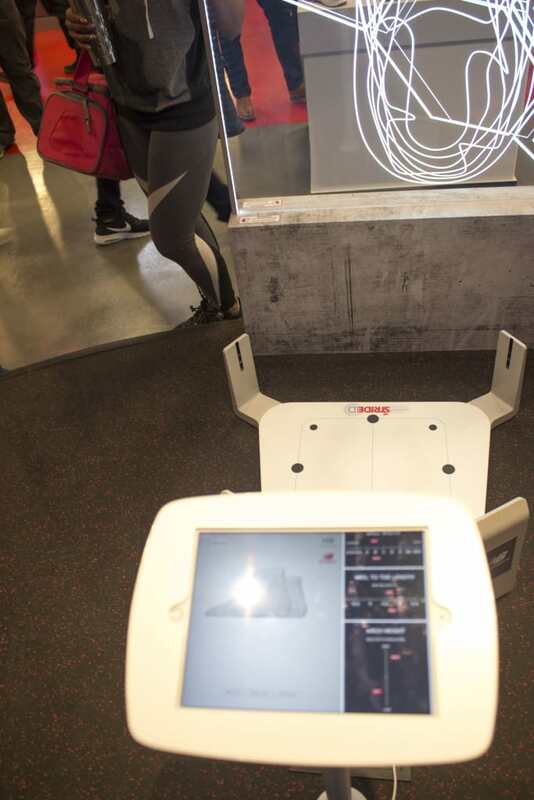 You can test harnesses and footwear on the ClimbStation climbing treadmill if you choose or just play on it like I did. QOTD: Which is your favourite feature? What would you like to see in your local store? Stay tuned for part 2 where I share what I learned about motivation and running from Alicia Bell! What I’m wearing: Under Armour Fly-By 2.0 Middy, Under Armour Studio Downtown Knit Jogger Women’s Pants (more info here). These pants are definitely made to move! Wall climbing and all! I don’t live in Canada but if I did I would totally be going to this store! 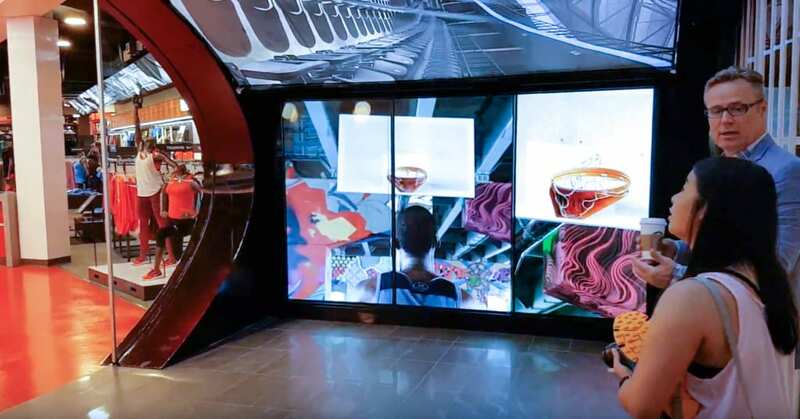 Looks amazing and they have brought technology in for a better shopping experience! I love it! Wow! What an amazing looking store. I love that they combined with Atmosphere too. That looks like so much fun! Needto go now! I love a good palace to fitness! I am crying over your comment “you know how much I love touching things” – I am veryyyyy immature! HAHAHAHAHAHAHAHAH! Wow!! 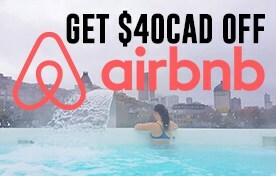 Looks like an awesome trip!!! That’s great that you got to experience all that fitness fun stuff. LOL. What a fun store – I’d love to visit! I’ve never heard of this store before but it looks SO fun! Love the climbing treadmill. WOW!! What a cool store! It’s almost an experience just walking through there!! I’m going there tomorrow and can’t wait! 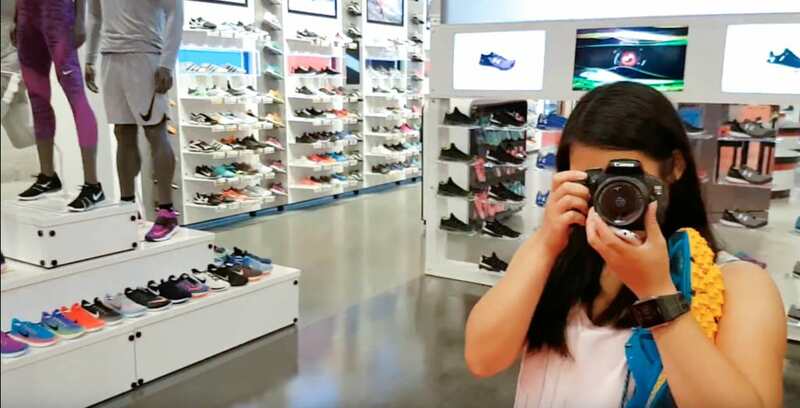 The store looks amazing in your photos!